Childhood is period typified by changes, both in the child and in the immediate environment. Changes in the child related to growth and development through infancy, childhood, and adolescence. Health and disease during the period from conception to adolescence must be understood against this backdrop of changes. This blog reviews the scope of Aplastic Anemia that affects children, with particular emphasis on the ways in which the unique attributes of the growing child and special aspects of his environment serve to modify the course, effects, and treatment of particular disease. 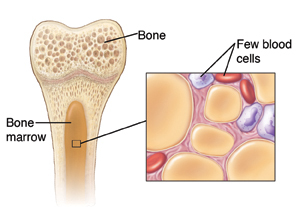 The bone marrow produces all blood cells red , white blood cells and platelets.Red blood cells contain the protein hemoglobin that carries oxygen from the lungs to tissues. White blood cells fight infection. Platelets are important for blood to clot. Less oxygen supply to the vital organs, tissue and the cells due to few red blood cells. Increased susceptibility to infections due to few white blood cells. Increased chances of bleeding problems due to few platelets. What are the probable causes of Aplastic Anaemia? Aplastic anemia in children has multiple causes, but many causes are Idiopathic meaning they occur for no known reasons. Other causes are secondary, resulting from a previous illness or disorder. It can be developed at some point during childhood or may be transferred from the parents. Radiation therapy and Chemotherapy: for the treatment of Cancer. How to Diagnosed Aplastic Anemia? Blood tests, including a complete blood count, Haematocrit, Peripheral smear. Bone marrow aspiration and biopsy – marrow may be removed by aspiration and a needle biopsy under local anesthesiology and conscious sedation so that the child remains calm and comfortable during the procedure. In bone marrow aspiration, a fluid specimen is removed from the bone marrow. In a needle biopsy, marrow cells (not fluid) are removed. These methods are always used together. Additional blood tests and genetic testing may be ordered to rule out certain inherited types of anemia and other disorders such as myelodysplastic syndrome. Treatment options include, but are not limited to the following. Supportive therapy: includes Blood transfusion, preventing antibiotic therapy,medications that stimulating the body to make white blood cells, and behavioral interventions like hand washing and avoiding large crowds or people who are known to have fevers or illness. The important point is that when dealing with a serious condition like Aplastic anemia, the beneficial effects of multiple therapeutic systems should be used in concordance with each other. There cannot be a single or exclusive line of treatment. Homeopathy medicines, as they do not adversely interfere with conventional medication, are absolutely safe. Homeopathy medicines have a very effective long term beneficial effect or preventive effect in terms of countering genetic tendencies and balancing disturbed immunity that are root causes of this serious malady. Homeopathic medicines effect to stimulate the healthy portion of bone marrow to improve cell production. This may help to reduce the number of blood transfusions. Beneficial in countering side effects associated with conventional therapy. The chances of relapse significantly diminish with homeopathy treatment. However, considering the pace and grievous nature of the disease, homeopathy alone may have limitations in managing Aplastic anemia. One cannot expect a miraculous cure for Aplastic anemia with homeopathy alone. Nonetheless, homeopathy treatment along with conventional treatment can add a lot to quality management of a patient with Aplastic anemia. It should be emphasized that Homeopathic treatment is not a substitute to any mode of modern medicine such as blood transfusion or bone marrow transplant, etc. The role of homeopathy is more complementary than the alternative, when it comes to managing Aplastic anemia. If you have any queries related to Aplastic Anaemia, do feel free to get in touch with Dr. Rajesh Shah’s associate doctors at Life Force Homeopathy or just send your query here. You may write to us at info@lifeforce.in or give us a call at +91-22-66888888.